It’s the last week of school! WHAT? I’ve always heard that as your kids got older, that time moves faster. Well, apparently it’s true. I literally feel like it was Christmas a few weeks ago! I mean it did snow last week, so I guess I’m not THAT crazy! But really, how are we already entering summer? 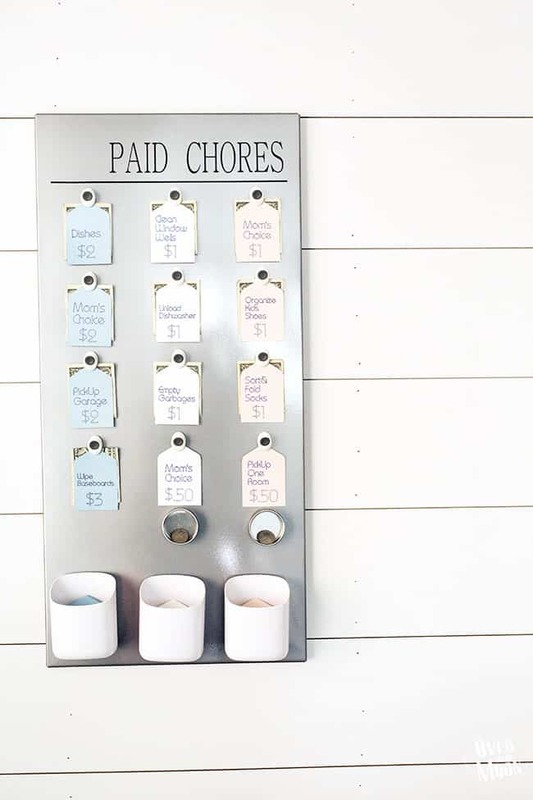 This last week I have been doing some summer prep and put together this fun DIY Kids Paid Chore Chart! Last summer I felt like any outing we went on I forked out ridiculous amounts of money on little things, like smoothies, sno-cones, treats, little toys, churros, etc! And that was around what felt like a bajillion “No’s” and “You don’t need that.” I knew this year that I wanted my kids to be able to earn their own money to spend on that kind of stuff. I cannot be a bank for them anymore! So, here’s what I put together! I’m pretty excited about it! It isn’t an eye-sore for my house and is just simple and to the point! 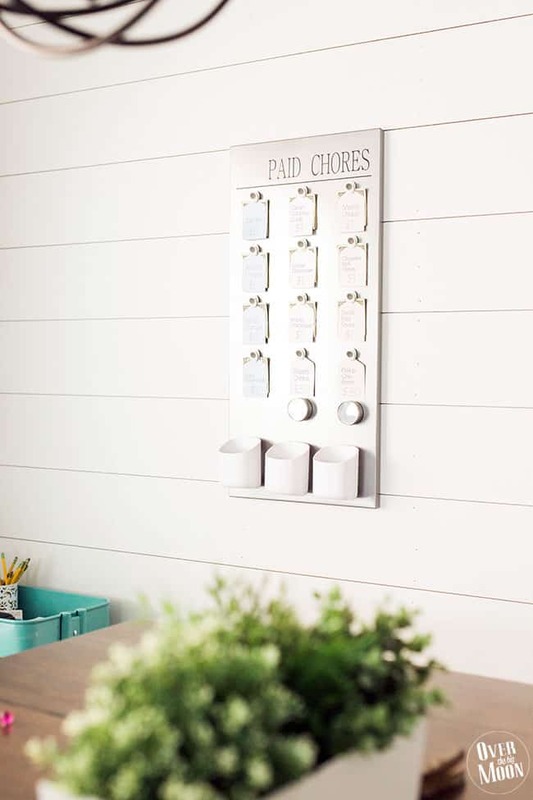 Because I have the Cricut files all put together for you, I really think you could put this together with 1 trip to the store and an hour at home! To start, get a magnet board. I bought mine at IKEA for $12.99. 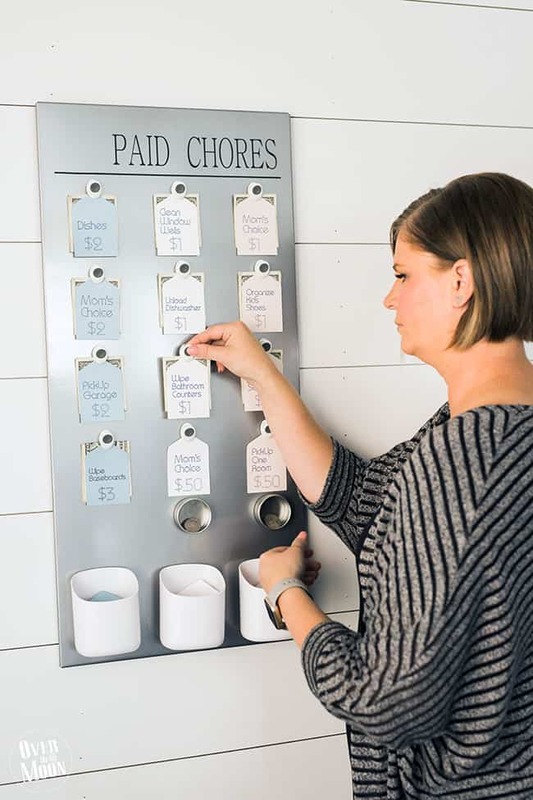 But, this magnet board from Amazon is a great option. I’m sure you could find something great at Target or WalMart too! 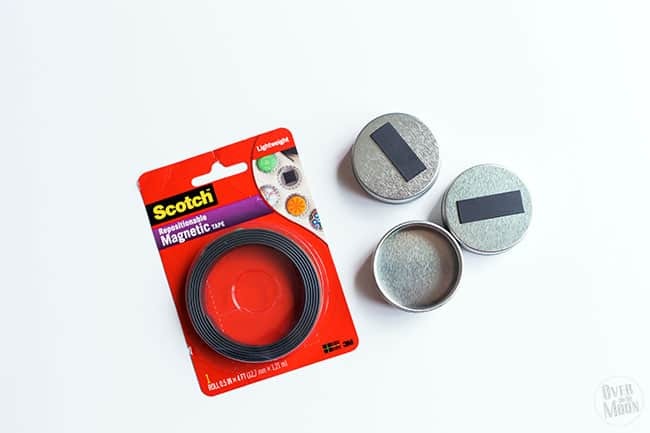 While you’re shopping for a magnet board, be sure to grab some magnets and cardstock you like too! I wanted a very neutral look, so I am using these clip magnets from Amazon. But, again, you could find something great at any store or Amazon has tons of options! You’ll need some 12×12 cardstock of your color choice. 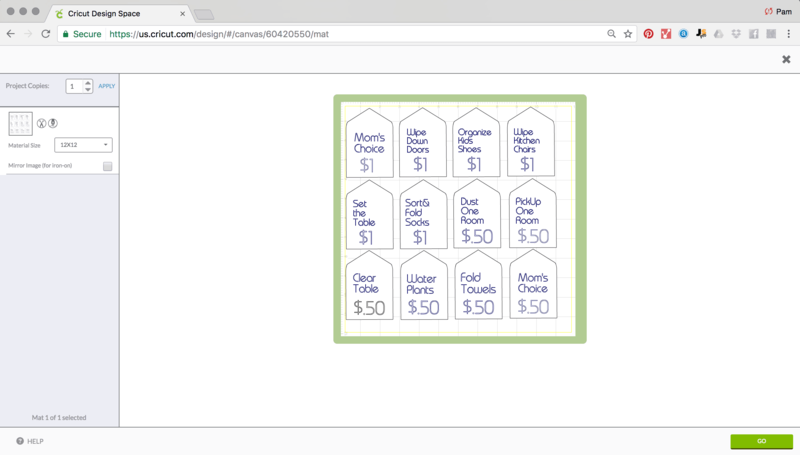 You can write and cut 12 tags per piece of cardstock with your Cricut Explore Air 2. So, get however many pieces of cardstock that you’ll need to write and cut all the cards you want! I used 3 pieces of cardstock, but I for sure plan on adding to my selection throughout the summer! 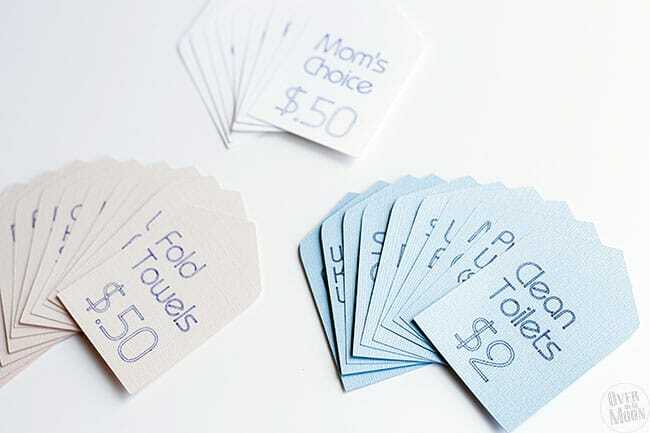 Lastly, you’ll need some sort of holder for the extra cards you won’t be using. I had some magnetic cups in my storage room, leftover from my Perch Kit. But, my friend made on too and just got a one from Amazon. I just looked and they have TONS of options! I am loving this one! You could also just get an old cup and add a piece of magnetic tape on the back and make it work! Okay, now let’s get to the fun part! Making the job tags! You guys, I’ve made it super simple for you! Just click the links below to open the files. At this time you’ll go ahead and edit any of the jobs or payout amount! If it’s done correctly, it will show the words “Attached Set” above all the layers! 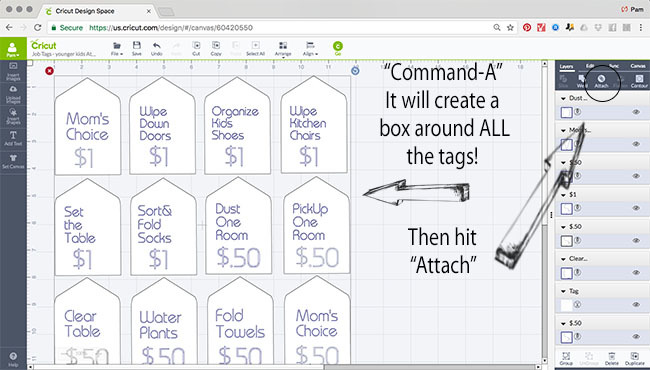 You are now ready to hit the “Go” button and write and cut your tags! When you get to the next screen the write and cut screen should look just like it does above! Once you confirm your screen looks like mine above, then hit GO again! 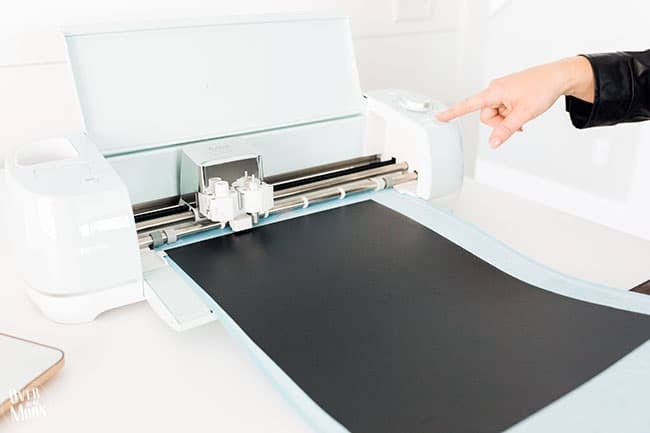 It will prompt you to load the color pen you choose, check the dial on your machine to make sure it’s set to Cardstock and load the mat (with the cardstock on it) into your Cricut Explore Air. Then it will prompt you to hit the GO button on your Cricut machine! Then the machine does ALL the work for you! It’s pretty much a thing of beauty! If you’ve never used the pen tool, you need to know the opportunities are endless for what you could use it for! 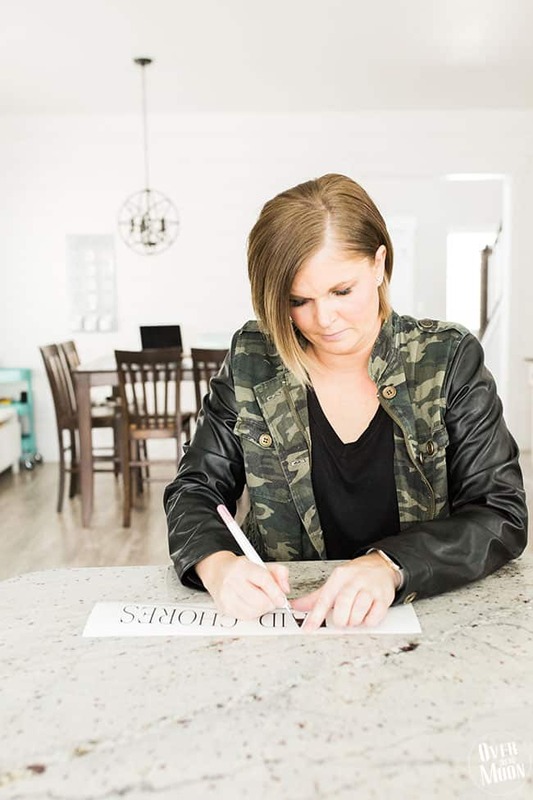 Think birthday and party invitations, teacher gifts, home decor and more! When it’s done, go ahead and peel the mat off the cardstock! This is a trick I do to help prevent the cardstock from curling! The tags will most likely be left on the mat. Then I just use the scraper tool peel them off the board! Seriously, how fun did these turn out? I still love looking at them! Next up we need to cut the vinyl for the top of the board! 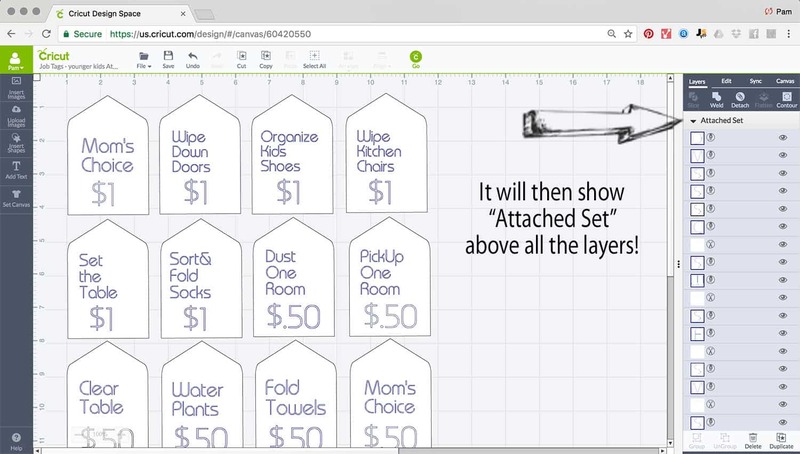 Just click the file above and then resize it to fit your magnet board! After it is resized, you’ll want to take the same steps as you did above with the tags and “Attach” the layers together. Then go ahead and hit “Go” and follow the prompts! 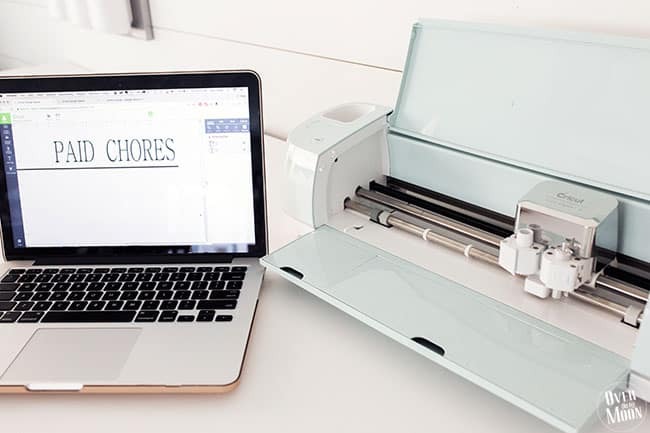 Also, make sure you change the dial on your Cricut Explore Air machine to Vinyl! After it is cut then you’ll need to weed the design and add transfer tape to the vinyl sticker. 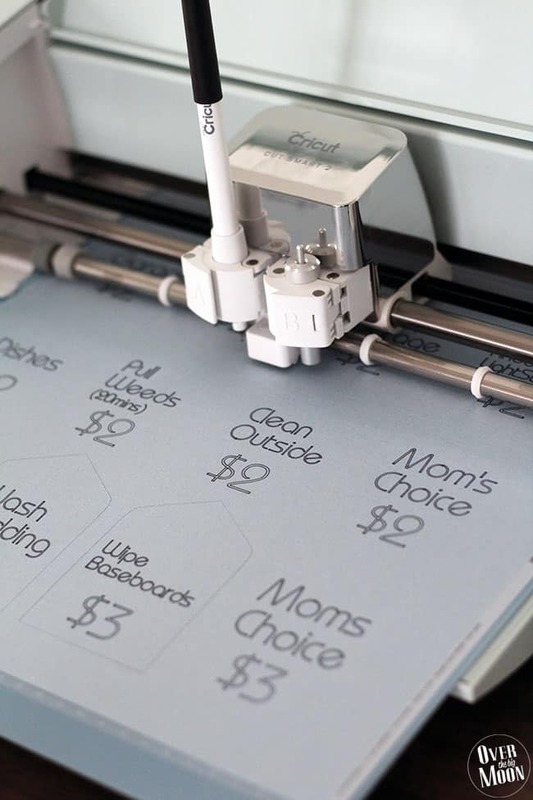 You can find some great tips on the Cricut blog for more information on that if you need it! 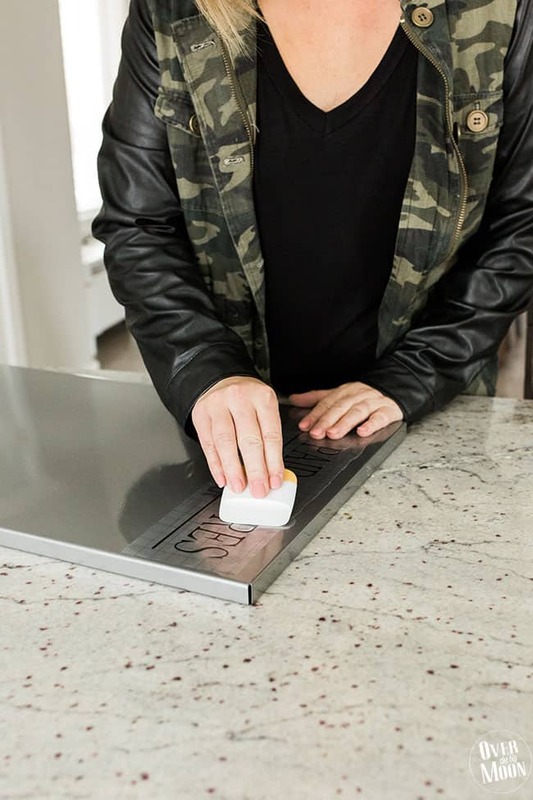 Then go ahead and apply the vinyl to your magnetic board. I find it best to use a pencil to mark on the magnet board where you want the top of your letters to be. That way it is easy to make sure it’s level! Then it’s time to assemble everything! 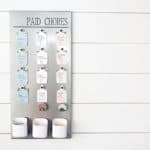 For the jobs that are only $.50 I used some little tin holders I had in my craft room! I just added a piece of magnet tape on the back of them! You could also just use little baggies! 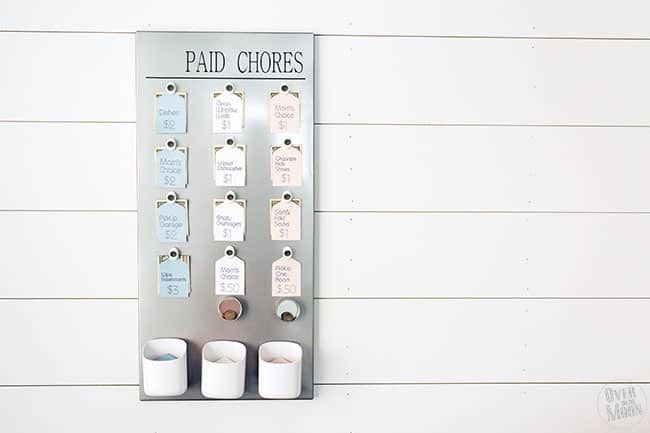 All and all I am beyond obsessed with how this turned out and my kids are so excited to earn some extra money! If you love this project, I’d love it if you’d pin the image below! Thanks friends! I can’t understand how to get the link to work could you message me with some feedback? thank you! 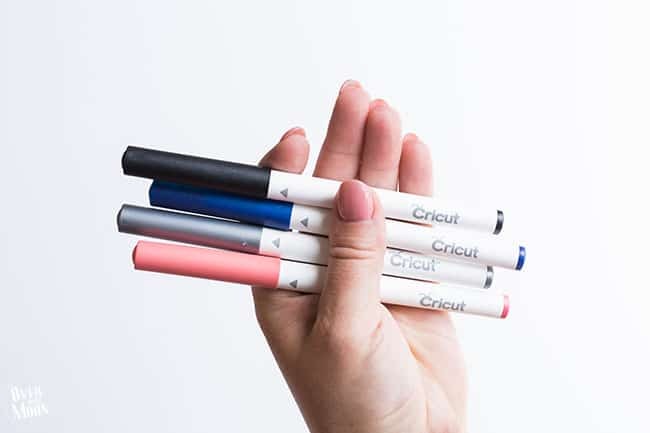 Is there another way to open these links for the cricut? 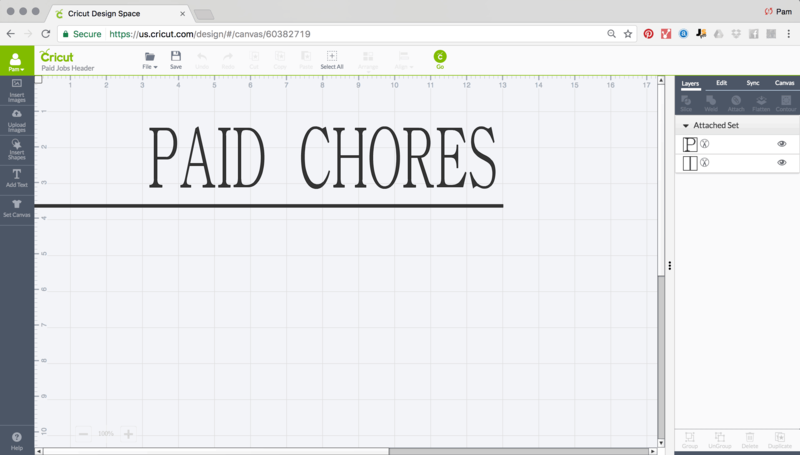 Or could you send a list of fonts/chores/etc? 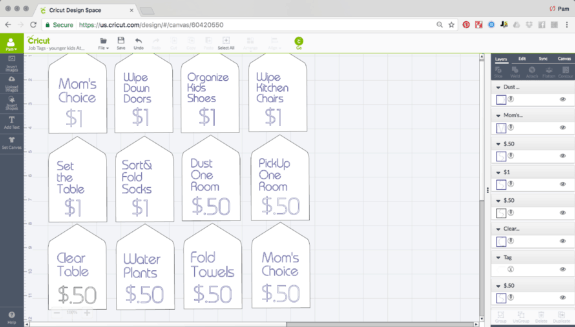 When I click on the links for the chore tags it just goes to the Cricut app but doesn’t pull anything up? What am I doing wrong? 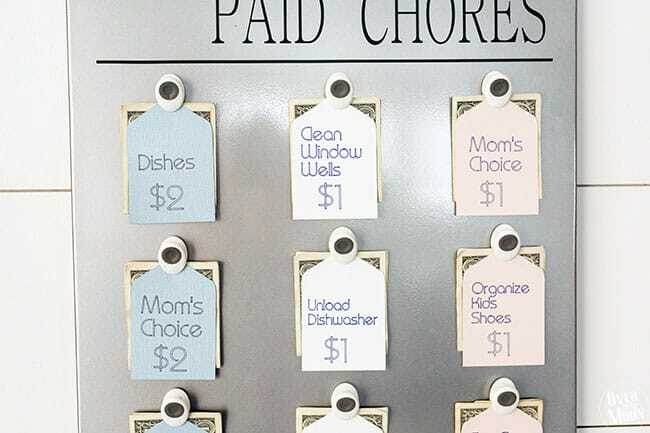 Love your chore chart and all your instructions! Wowza! Classy, clean and great parenting tips too! I totally get the non stop purchase requests during the summer. 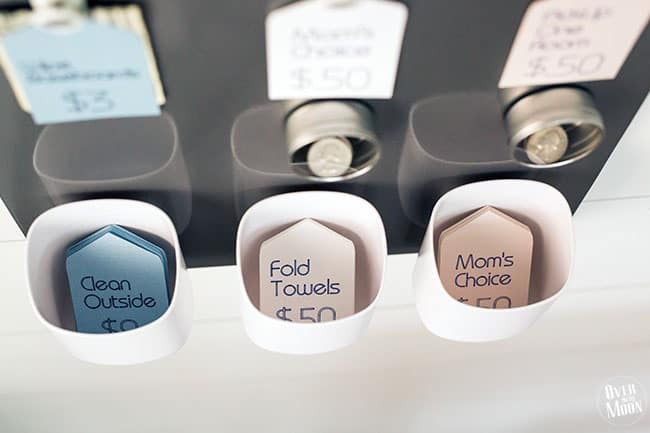 Great solution, motivator and lovely home decor too! You’re so sweet Deanna! Can’t wait to get together and have you teach me your skills! hehe!